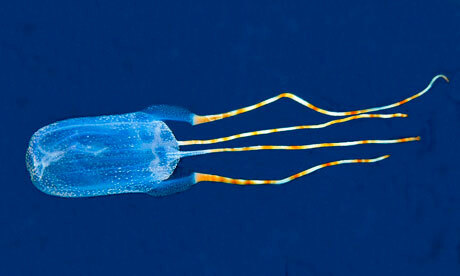 The sting of the Bonaire banded box jellyfish is said to be extremely painful. Kralendijk- STINAPA warns for the presence of the Bonaire Banded Box Jellyfish (Tamoya Ohboya) in the beaches or the water around Bonaire. The warning by STINAPA comes after reports of the jellyfish on the beach and in the water at Sorobon. STINAPA urges swimmers to be very careful with the presence of the jelly fish. “Do not touch or step on the Box Jelly, as the sting is even nastier and more dangerous than the sting of the Portuguese Man-of-War” writes STINAPA in a press release.